The tale of Red Riding Hood has endured for centuries thanks to its compelling story filled with rich imagery, supernatural lore, and its underlying themes that strikes a resonating chord with the coming-of-age crowd and adults alike. Numerous college lectures, thesis papers and books have attempted to analyze the so-called subliminal theme of sexual awakening buried within the subtext of the fairy tale, and it's this very theme that director Catherine Hardwicke seems to have latched onto when creating her modern day adaptation of the classic tale. 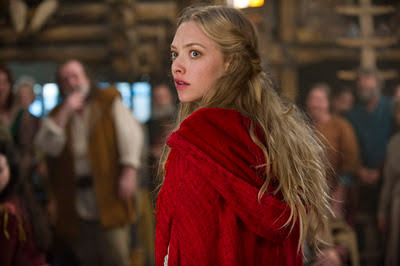 Aside from the flowing red cape that adorns our young and naive Valerie (played by Amanda Seyfried) who plays the leading role in the film, there's nothing in the film that even remotely resembles the classic fairy tale and in fact you'll probably only remember it's derived from Red Riding Hood source material because the hood is so blatantly crimson red against the drab medieval setting. Even the wolf, apparently not cool enough to be a real wolf, has been changed to a ferocious werewolf that has the ability to morph into human-form during sunlight hours and even has limited telepathic powers. Even on its own, the story of Red Riding Hood is a constantly changing target which never seems to settle into a consistent tone, dipping into gothic horror during some moments, then into a Twilight-esque teenage heartthrob flick the next. The plot is about as cheesy as it gets, which has our wide-eyed Valerie betrothed to the gorgeous young blacksmith Henry (played by Max Irons) from the wealthiest family in town, yet she is madly in love with the poor woodcutter Peter (played by Shiloh Fernandez) whom she's loved her entire life. 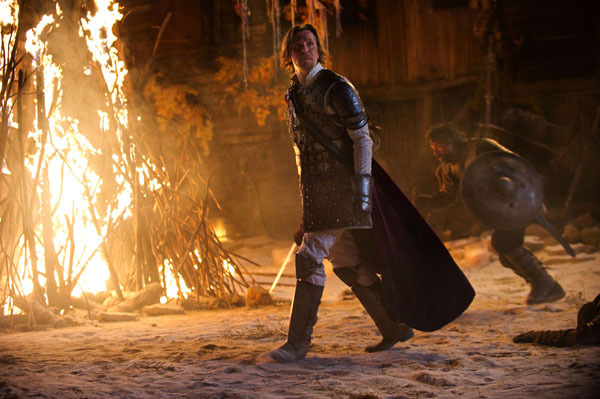 Not wanting to proceed with the marriage arranged by her parents, she plots to run away from Daggerhorn (that's really the name of the village) with Peter, only to have her plan stymied by the big bad werewolf. What results is a teenage love circle that could easily be an episode of Jersey Shore, mixed with hand-me-down sets that look like they were borrowed from the Twilight series. 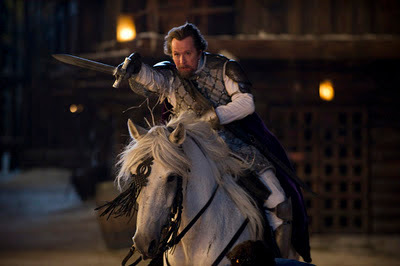 While the dialogue as a whole rarely seems to advance beyond campfire chatter, once Father Solomon (played by Gary Oldman) arrives with his plan to destroy the wolf, his commanding voice delivers some memorable speeches. As a whole, the only two characters worth their weight in gold are Oldman and Seyfriend, and the pair carry the entire weight of the film on their shoulders. The handsome gents vying for Valerie's hand feel like deadweights that are only present to sexualize the film with unnecessary masculine tension that never seems to rise above artificial and campy. Technically, Red Riding Hood comes to Blu-ray mixed in 5.1 DTS-HD Master Audio, and is presented in 2.40:1/1080p/AVC﻿. ﻿ This encoding is quite bold, delivering some vibrant reds and warm amber hues mixed with deep blacks and crisp whites, all without much distortion. For the most part, the enclosed village of Daggerhorn fits its medieval setting with it's bleak textures further sullied with a light camera haze that reduces the depth, amplifying the feeling of claustrophobia. On the audio side the movie fairs even better with booming bass sounds and thumping medieval rave sequences created by Alex Heffes and Brian Reitzell. Sound effects really deliver as well, with snarling wolf sounds, crackling campfire flames and fierce battle sounds enhancing the overall mood. Extras include picture-in-picture commentary with Catherine Hardwicke and cast and crew, casting and rehearsal tapes, gag reel and deleted scenes, as well as an "alternate cut" that's used as a main selling feature but really only amounts to about an extra minute of footage. Overall, most of the bonus features are forgettable, aside from perhaps the "Making of the Score" which is an interesting look at the recording of the film's soundtrack, and "Before the Fur...Making the CGI Wolf" which shows how they created the furry villain. Had Catherine Hardwicke stuck closer to the source material perhaps there might have been more suspense and wonderment behind the film. What we have here though is a convoluted gushy love mess that never quite picks up traction nor drags you in. Amanda Seyfried and Gary Oldman deliver powerful performances which almost make this movie worth watching, but alas they're both dragged down by a sludge of haphazard writing and mediocre ﻿supporting roles. The entire experience looks greats, and sounds even better, but it's really hard to appreciate the artistic elements of the film when there's not enough substance to keep your attention hooked.